Best Berlin Blogs 2019 - As Selected by Locals! 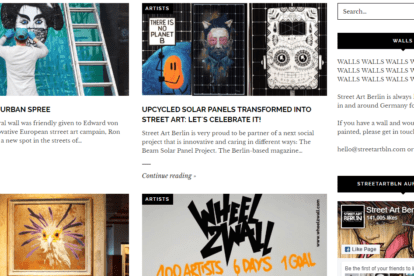 Best Berlin Blogs 2019 – As Selected by Locals! We asked our own Berlin bloggers about their favorite independent Berlin blogs & websites. Here’s a list of their tips in alphabetical order! Awesome Berlin is a blog dedicated to providing readers with an insider view of Berlin. 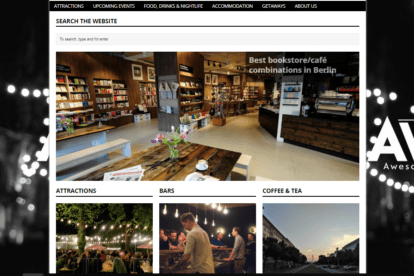 The blog produces articles on the food, culture, and lifestyle of Berlin, and includes ongoing or upcoming events that are open to the public to enjoy. They also offer a wide range of information on accommodations, the Gay nightlife and fun tips on what to do while visiting Berlin. 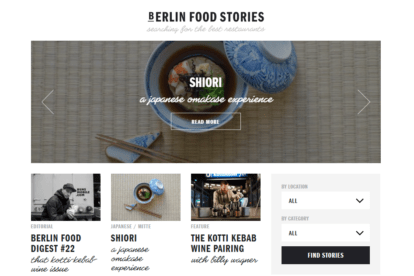 If you’re looking for comprehensive reviews and fun articles on places to eat in Berlin, the Berlin Food Stories blog is always a good choice. Part foodie blog and part information/review blog, the blogger writes about their experiences with restaurants within Berlin, while providing short informative pieces that include the history and culture of certain dishes or restaurants within the city. 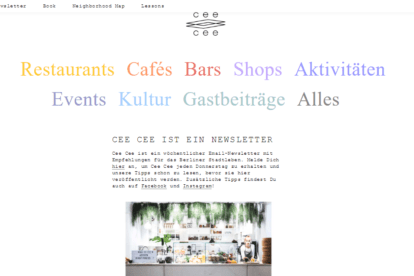 Lifestyle, activities, events and food, Cee Cee (in German – translation here) is a comprehensive blog that dabbles in a little bit of everything about Berlin. The blog updates regularly every Thursday and provide readers with weekly information on the events, new and classic restaurants and bars, as well as the culture of Berlin. 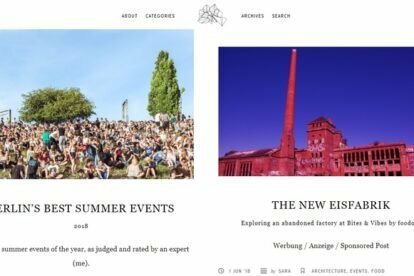 They give guests opportunities to post about their own favorite places to go within Berlin and give local tips on what to do to enjoy the full experience of staying in the city. This blog is a true pleasure for the eye. The design, layout and photographs used are amazing and make you want to keep on browsing on it forever. Finding Berlin is about all things in Berlin, from food to events to summer guides. It features nice story-like posts that are very nice to read. A great blog to visit if you’re looking to get a feel for the vibe of the city in general, and of course for some great tips on where to go and what to do. 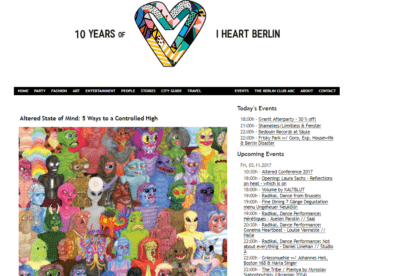 If you’re interested in the more art, fashion and entertainment areas of Berlin, then you’ll definitely want to keep an eye on iHeartBerlin. This blog is made by locals who are interested in the interesting, and sometimes bizarrely strange, arts sectors of Berlin. The blog updates regularly and has fun, informative content, while also providing readers with a comprehensive list of events that have to do with fashion, art, entertainment, and people within Berlin. 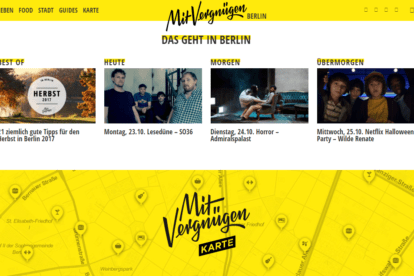 Mit Vergnügen Berlin (in German – translation here) is an independent and local travel and guide blog about Berlin, providing readers with informative insider tips and reviews about places and activities within the city that are ongoing or upcoming. The articles range from food to life in the city and just the city itself, producing excellent information for those who want to get to know Berlin on a local level. If you’re looking for a good blog that delves into the street art scene of Berlin, then Street Art Berlin is one that you should check out. The blog posts regularly about interesting new and classic pieces of street art, recording them through images and articles, and also write about street artists and their projects within the city. Each piece is well thought out, informative and exciting, making for an enthusiastic retelling of some of the best street and public art found in Berlin. 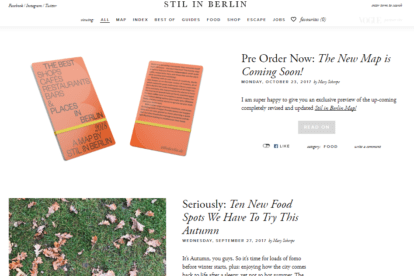 A fun blog that explores and guides visitors through the city with interesting and fun story-like articles, Stil in Berlin is a very personable blog that gives readers the inside scoop of the city, and also provides quality write-ups of where to go, eat, see or do things in Berlin. The blog updates regularly and always have fresh, new information for those who love to explore the city to their heart’s content, providing a wide range of information on new, upcoming and classic places within Berlin. Did we miss your favorite blog about Berlin? Please let us know at berlin@spottedbylocals.com!